I focused on the colours and layout but changed the season. 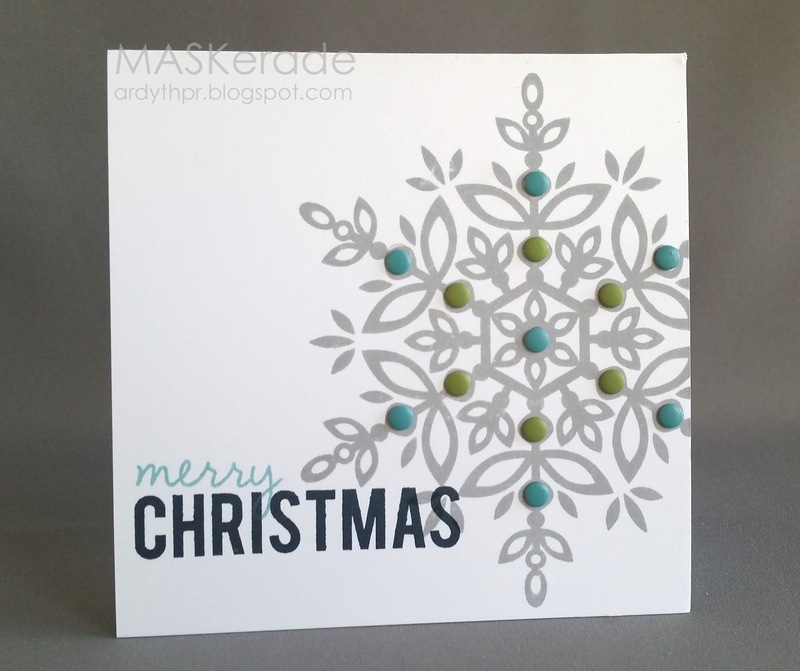 I chose a big Stampin Up Festive Flurries snowflake to provide the 'circle of colour', stamped it in Smoky Slate and filled in some of the circles with Stampin Up candy dots in Old Olive and Baja Breeze. I loved the idea of the combined script/block sentiment and used a Papertrey Merry and Gina K Christmas. I hope you'll get a chance to play along - the deadline is Monday morning at 8 am. At that time you can vote (even if you didn't link up a card!) for your 3 favourites until Tuesday morning at 8. The voting results will be posted on Tuesday at noon. Hope to see you there! The large snowflake image is nicely augmented by the candy dots. I love the two fonts of the sentiment. I love the pops of color on the snowflake Ardyth. Ardyth, this card is just so awesome! I love the grey snowflake with pops of colour. Gorgeous! Love the lime and turquoise. So crisp and clean. What's not to love about a giant snowflake? :) Love the colors that you used! such a bold, yet simple card! I love this enormous snowflake, so classy. For your information- Brusho is a crystallised ink that comes in many colours and can be diluted and used as ink or you can sprinkle in on wet or dry paper then spritz and watch it explode. I used it many years ago with my kids in art class, they loved how the colours exploded and changed! It's very much back in vogue but not particularly new. GORGEOUS!!! The contrast in the fonts in the sentiment is perfect! As always, I'm in awe of your perfectly stamped image! The candy dots look great! Love the large snowflake! Everything about this card is wonderful!